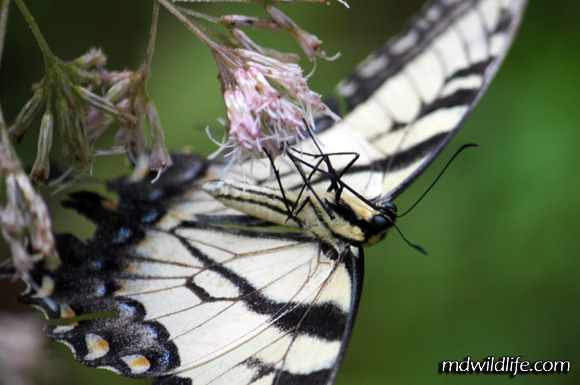 A male eastern tiger swallowtail spreads its wings at Dan's Mountain WMA. 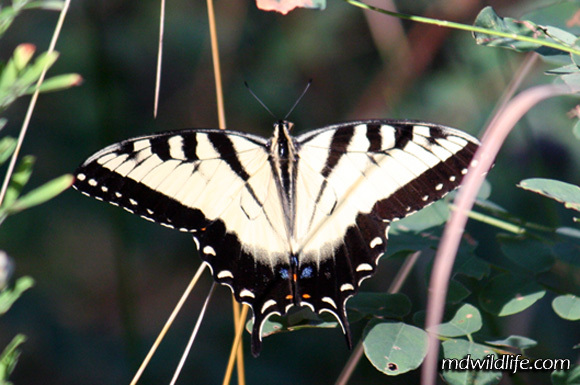 The Eastern Tiger Swallowtail (Papilio glaucus) is a large and very easily identifiable swallowtail. Underside of an eastern tiger swallowtail, working this flower at Elk Neck forest. It is most common around Maryland in the later summer months – late July and August – and when around, it is abundant. It can be found it deep woods, around water and streams, along paths, in fields, fluttering on the side of the road … etc. Basically, it’s comfortable in a lot of places. It will often give a really good spread, landing on flowers or plants, opening its wings and pausing. You can usually get pretty close without startling it as well, if you’re looking to take some photos. It has closed wing markings similar to that of some of the darker swallowtails, but its yellow colroing obviously separates it. A view of the dark female Eastern Tiger Swallowtail. I have found this swallowtail at almost every location visited, from Dan’s Mountain and Sideling Hill in western Maryland, down to Eastern Neck Island and Idylwild. I also saw and photographed several at Elk Forest and Millington WMA. Eastern Tiger Swallowtail males and yellow females can be individually identified by the amount of blue displayed on the tail end of their wings. From a top view, the male has small blue circles at the inside of its hind wings (as in the photo at the top of this entry), while the female has a larger field of blue across her hindwing. 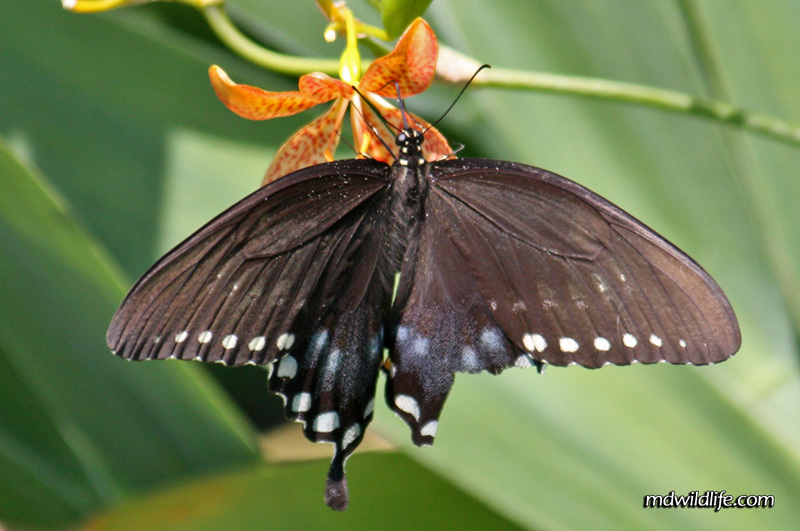 Your posted photo labeled pipevine swallowtail is actually a dark tiger female.